The definitive 1913 Model F was used by the US Army as well as the US Navy, and sold to several civil owners and a number were exported. 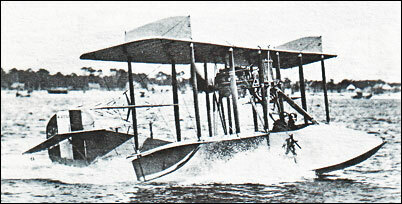 Of wooden construction, the two-bay biplane had inter-plane ailerons on each side, fabric-covered wings and tail unit, and a carefully contoured single-step plywood-covered hull which accommodated two side-by-side in a cockpit location just forward of the wings. Power was provided by a 56kW Curtiss O engine driving a pusher propeller, the engine being mounted on struts just below the upper wing centre-section. The 1914 version of the Model F had rounded wingtips, a tougher hull and increased strut support for the engine to prevent it collapsing on the crew in the event of a crash. This basic design was ordered by the US Navy, and after the United States entered World War I on 6 April 1917 it was adapted as the service's standard primary training flying-boat, 144 more being ordered. The 1917-18 version of the Model F eliminated the original shoulder-yoke type aileron control in favour of a more conventional arrangement; and some aircraft had the ailerons transferred to the upper wing from the interplane position, span of the upper wing being extended. Several ambulance conversions flew with provision for a stretcher patient to be carried above the hull behind the cockpit. The more powerful Curtiss OXX-3 engine was fitted from 1917 onwards. The Model F, particularly in its earlier versions, was sold to a number of foreign navies. Russia obtained a considerable number for operation in the Baltic and Black Seas. The Italians also flew the Model F and eight examples were licence-built by the Zari company at Bovisio. There are persistent local legends that at some time in the past a flying boat made trips to and from the Cumberland River near Canton, in western Kentucky. None of the legends are specific as to the type of flying boat or time frame. Most put it during Prohibition in the 1930s, but some say that it was earlier, in the 1910-1915 era. Does anyone know if a Curtiss flying boat was sold to anyone in the area in that era? Super grateful for your site! Fun and educational. One question: I keep seeing that 850 mile range figure in different places on line. Is that right? At 65 knots, for 5.5 hours, aren't we talking more like 350 miles? I have authored a book titled 'Aircraft Design' published by Cambridge University Press. In my next publication titled 'Aircraft Performance' and in the 2nd edition of 'Aircraft Design', I wish to use this 3-view diagram of Curtiss Model 4. I will be grateful if you kind allow me to use this diagram, of course acknowledged with the credit 'Courtesy of......',. In the year of 1916, they sell 3 Curtiss F to the Brazilian Navy; in 1918, 1 Curtiss HS-2 and 4 Curtiss F, and more 1 was license-built by the EAvN (Navy Aviation Scholl). Please correct my bad english. Where did you find the three-view drawing? Do you know iif I could use it in amy book on the life of Sir John Alcock, aviator?